I’m a huge Teenage Mutant Ninja Turtles fan and have been since the cool dudes with attitudes hit the airwaves in 1987. With the movie reboot that came out last night, it’s time to dedicate some space to turtle power and discuss the greatest reptiles ever. Let the debate begin! 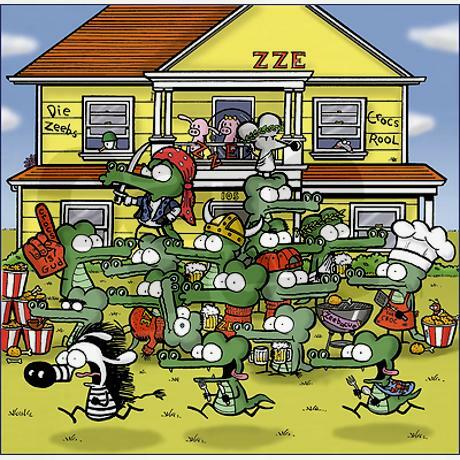 Some of the funniest Pearls Before Swine comics involve the Fraternity of Crocodiles (under their official name of Da Brudderhood of Zeeba Zeeba Eata) trying to get their chompers wrapped around the animals of Albany, California. These crocs really aren’t very bright, but they’re enthusiasm for eating zebras is unrivaled. Their failed attempts at procuring dinner is akin to Wile E. Coyote’s efforts and you find yourself routing for the bad guy to pick up a win. I love this little mascot, who despite his gentle nature, seems to have a bite to him, as well. He is, after all, the smartest man in the room at high-level Geico meetings and that might be saying something about the insurance industry in general. The Geico Gecko was born out of the 1999 Screen Actors Guild strike, which resulted in the company not being able to use live actors. Kelsey Grammar originally voiced the character, but he has evolved into more of an everyman gecko with a Cockney accent. 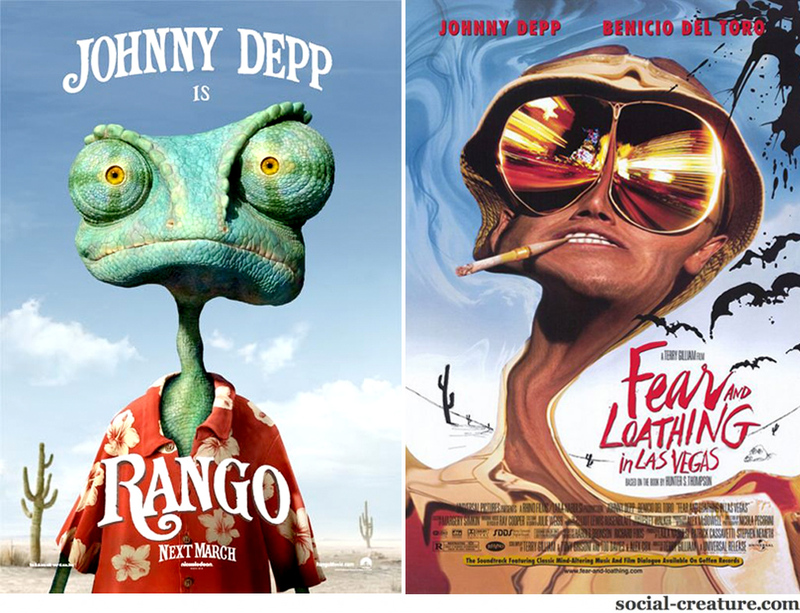 Perfectly cast, with Johnny Depp providing the lizard’s voice, Rango is the tale of a fish-out-of-water chameleon, who becomes sheriff of the desert town of Dirt and uncovers a mystery involving the area’s drinking water. I also have to give Rango props for dealing with the dreaded Rattlesnake Jake, using his brains to defeat the brawny gunslinger. Anytime a slithering snake is defeated, the Sip Advisor is a happy man. One of the greatest video game baddies of all-time, Bowser seems obsessed with Princess Peach to the point that he’s kidnapped her so many times she’s developed a severe case of Stockholm Syndrome and doesn’t mind playing board games and going go-kart racing with the evil lizard king. Bowser even has his family members getting in on the sinful acts and you may defeat them, but the princess will likely be in another castle! You had to know that these four heroes in a half shell would take the top spot. Of course, Michaelangelo is my favourite among the troupe, but each member of the team holds a special place in my heart and brings something different to the table. One of my favourite things about the TMNT franchise is all the different sidekicks and villains that were introduced, from Casey Jones to the Shredder, and all the Bebop’s and Rocksteady’s in between. I have to throw some honourable mentions out to Dino (Flintstones), Godzilla, Tick-Tock (Peter Pan), Sir Hiss (Robin Hood), and Reptile (Mortal Kombat). One reptilian that is definitely on the hate list is Barney the Dinosaur… he gives all prehistoric beasts a bad name and should have been slaughtered by the Transformers Dinobots crew. 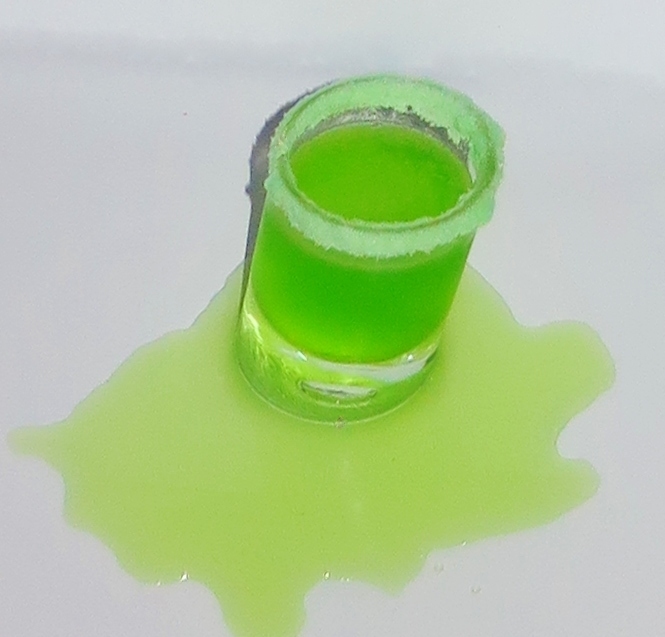 I wasn’t really happy with the Mutagen and other Ninja Turtles-themed drinks that already existed (although Drunken Moogle has a neat cocktail that actually uses the toy mutagen canister for its glass), so I built my own shot version, using as many green-coloured products I had in my arsenal. The results were a fruit punch of sorts, including the Lime Cordial Mrs. Sip and I made ourselves. This shooter also provided my first chance to use my new tilted shot glass, which goes perfectly with the theme, in my honest opinion. This entry was posted in Shots & Shooters and tagged Barney, Bebop, Bowser, Casey Jones, Da Brudderhood of Zeeba Zeeba Eata, Dino, DinoBots, Geico Gecko, Godzilla, Johnny Depp, Kelsey Grammar, Lime Cordial, melon liqueur, Michaelangelo, Midori, Nintendo, original recipe, Pearls Before Swine, Pisang Ambon, Rango, Rattlesnake Jake, Reptile, Reptiles, Rocksteady, Secret of the Ooze, Shooter, shot, Shredder, Sir Hiss, Sour Apple Mix, Sugar Candy, Teenage Mutant Ninja Turtles, The Fraternity of Crocodiles, Tick-Tock, Wile E. Coyote by Daniel Wilson. Bookmark the permalink.